A couple of years ago, I made Lobo a crocheted Gotcha Day PomPom Hat. It had been years since I crocheted a hat. It came out a bit Wabi Sabi, but it was adorable and Lobo loved it. After posting the photo, I got a lot of messages asking if I was going to make more. Some even asked if I would consider making hats with matching scarves. At the time, I wasn't sure. 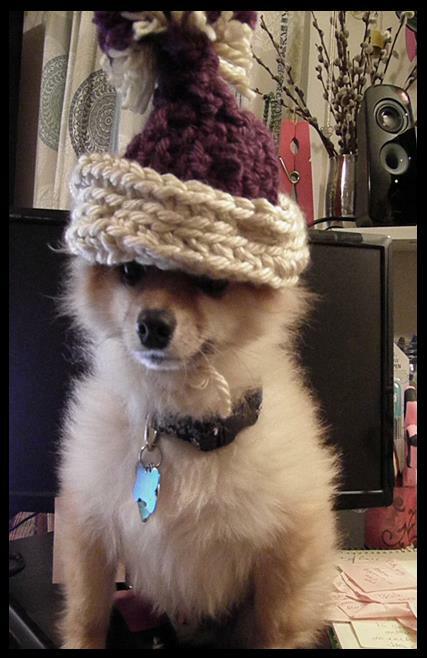 To this day, I'm still getting the occasional message asking if I'll be making doggy hats with matching scarves. The other day I was going through my folders of photos and came across the photo of Lobo wearing his hat. Lisa was in our home office at the time. She marveled at the photo. "You should make dog hats and dog scarves. That would be a cool DIY Dog Mom Project." "I'd have to go yarn shopping and spend at least a week making enough to offer up for grabs." "Do it. Seriously. I think they'd be adorable."